Just a few more days until Allegiant comes out and i felt that it was time for me to finish #2 in the series to get fully up to speed. I think that it’s key to re-read stories like this so i’m not wondering why certain people are alive and others not, and why some are on one side vs. the other. This 2nd installment takes us past the chaos of the ending in Divergent into a completely different set of obstacles. The questions that remain to be answered are vase and wide spread and that makes for a really exciting bridge book. Tris and Tobias are in an endless battle to survive and fight for what’s right, all the same while trying to get to Jeanine and figure out what’s going on. Marcus continues to play a strong role in this book, yet i don’t think that we ever really find out what his deal is…well not until the end. The action continues to be packed into every scene, you never know who will be next to be injured, or which faction will be the one to help out the Dauntless (not the Dauntless Traitors). We continue to see that Euridite has their own motivations for just about everything that they do – and while the underlying need to seek information and learn is the core of the faction, we find that it’s more of an evil motivation based on their leader’s choices. All hope isn’t lost for them since we do find that there are some that are willing to help and they do at that. Among the Dauntless though, there’s a lot of flip flopping. We never really know who is on Tris/Tobias’ side, even when they prove it one way or another. Peter for example, he’s an enigma. Working with them in one scene and against them in another. The same with Tori. And what makes me really angry the 2nd time that i read this was Caleb. I remember his actions the first time around, but i guess i blocked them from my mind because when i read this installment again, i realized that he really has his own personal motivation. What i loved…the ending. I mean really – it’s not that i didn’t see it coming, but i really like where it’s going. I think that throughout the first 2 books, you get this idea in your head of what the factions are and what ‘chicago’ is all about but i like that there were hints throughout of Amity being the only faction ‘outside the fence’ and then to see where things go in the last few pages of the book. So, next week is D Day – meaning that the book will be out and i’ll finally get to see what it all means for both the story, society and Tris and Tobias. I can’t wait! 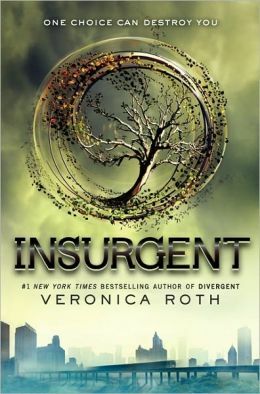 This entry was posted in Dystopian, Reviews and tagged divergent, Dystopia, Insurgent, Veronica Roth by iscm13. Bookmark the permalink. I really loved the ending too! The video and the “Prior” part has me so excited for Allegiant! 🙂 Great review!